Armageddon came to our house last week. Just before bed on Sunday night, Fluffy went to check his email one last time and noticed we had no internet connection. After trying his usual tricks without success, he came to bed hoping that it was a temporary problem that would be solved before the next morning. It was not. We woke up on Monday without internet service, but also without our telephones or TV channels. All of these services arrive magically through a fiber optic cable, but somehow the magic had been taken away. For some people, surviving without telephones or television, or an internet connection, is no big deal. For Kathy, queen of the universe, it is the equivalent of going without air. There are cokeheads who are less addicted to crack cocaine than I am addicted to Google. Losing the telephone was no big deal, because I don’t like to use it anyway. I rarely make telephone calls, and we have our landline mostly for the convenience of the 10,000 telephone solicitors who call us. Fluffy has a TracFone, which I understand is the bottom feeder of cell phones, and is made for people like Fluffy who want cell phones only for the direst of emergencies. I do not even know how to use it. He has a cheapo plan that costs less than $7 per month, and we get a limited number of minutes. That’s all we need. Fortunately, Fluffy knows how to use it. As my Perpetual Employee of the Month, he knew that I might get in just a wee bit of a snit if I had to be without my internet connection all day, so he called our unnamed service company (it rhymes with “horizon”) for help. He was on the telephone for forty minutes, using our precious cell phone minutes, listening to the most annoying hold music on the planet, and talking to techno-dweebs on two continents. Then he returned to me with the cheery news that the soonest anyone would be able to come and fix my business connection, for which we pay in excess of $150 per month, would be Thursday. I could feel a meltdown coming on. Have I mentioned that my entire professional life is conducted via the internet, and that not one single person I work with is in Virginia? Wait. One of them is right in our ward. But the rest of them are in North Carolina and in Utah and in California and, in one instance, in China. I can’t exactly send up smoke signals and expect people to see them if the internet is out. The internet is the only — and I reiterate, only — way we communicate. But this did not seem to bother our “horizon” internet service provider. You see, they already had our $150+ for this month. Besides, the customer service representatives who “helped” Fluffy were conveniently located off in India and in some unnamed U.S. location. It’s not as though Fluffy could have hauled off and punched them. Even when he pleaded with them and told them I needed the internet link a normal person needs air, the best they could come up with was Thursday. So when Fluffy sat down for our morning prayer, you could say I was not in the best frame of mind. It was my turn to pray, and I finally gave up and prayed with my eyes open because Fluffy was rolling his eyes so much. That is one thing about Fluffy that you probably do not know. He is so adept in the eye-rolling department that he could teach eye-rolling classes to fifth-grade girls. He rolls his eyes with his whole head, so there is a whole lot of movement involved. So when I was saying the prayer on Monday morning, his eye-rolls were so, shall we say, enthusiastic that I finally gave up and watched the performance. But I hope God was getting a kick out of it, and I thought I’d watch the histrionics too. But eventually we got through the prayer and developed what little game plan we could. First, we tried to call my employer on Fluffy’s TracFone. It rang and then went to voice mail, and I can see why. We don’t answer our phone unless caller ID tells us who is calling, and undoubtedly my employers have the same policy. So that scheme did not work. 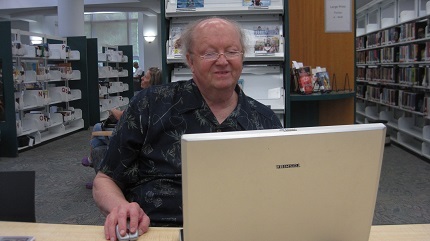 So Fluffy took our 2003-vintage laptop to the library and plugged it in. Using the library’s Wi-Fi, he went through my email and identified the files I was going to need for Tuesday’s work. He downloaded those files on a memory stick and brought the data home to me. I edited the files, returned them to the memory stick, and sent Fluffy back to the library. He uploaded the edited files and sent them to my employer’s webmasters. My work was finished for the day. Whoever thinks that Fluffy’s retirement means he sits around all day should watch that little fellow in his dotage. Cobwebs do not grow under his feet, believe me! This was how I did my work. But I did not even see my email, or answer a single question via Google, or reach out to a relative on Facebook, or exercise my brain with Lumosity. All these things take hours of every day of my life, but not on Monday. It made me realize how much of my life was connected to that darn internet. My internet withdrawal continued on Tuesday, Wednesday, and Thursday. No, my “horizon” was not that wide those days, thanks to our unnamed internet provider that could not be bothered to send out a technician to fix our business connection. And this is not even taking into consideration the tiny detail that one of my church callings is to write and send out an underground newspaper, The Algonkian Gazette, for our church congregation every Tuesday. Perhaps that is not part of our business plan, but it is certainly important to me. Tuesday came and went, and I still had no internet. Guess where I wrote the Gazette? In the library — that’s where. And I can tell you this: I am not cultured enough to sit in a library. I could just feel the underpinnings of the walls crumbling. The very walls knew something was out of sync with the universe. Did our internet provider care? Not a whit. I saw, but did not have time to read, my email when I was in the library. There was a huge flurry of emails going the rounds among my cousins and sisters (there are eight of us who are part of the group, although since I wasn’t there I guess there were only seven), regarding some correspondence that was found between some of our great-uncles. The correspondence must have been scandalous, because it concerned who was going to adopt our three orphan mothers when their parents died. Apparently both sides of the family were crazy, and there was a debate over which side of the family was less so. We know the end of the story, of course, but these letters reveal once and for all how the family sausage was made. Of course, I don’t know any of this first-hand because I didn’t have time to read the emails. I just saw they were there. Fluffy read one of them on Monday when he was at the library, and that’s all I know. He did say cryptically that the correspondence revealed that all three sisters were spoiled brats. You can bet my sisters and cousins are fascinated with that little tidbit. Fluffy reading scandalous news at the library. But by the time I have my internet back the conversation will be old news, along with all the family feelings of camaraderie the conversation engendered. And how often do my cousins have conversations like this one? Gee — I don’t know. I am sixty-five years old and this is the first one. Too bad I will have missed it. But what does the internet service provider care? They already have my money for the month. Meanwhile, television shows were being broadcast willy-nilly without any viewing pleasure in the Kidd household. They even were being recorded like crazy. At least, the video recorder thought it was recording those shows. When we played them black, we saw the black screen of death. It was hardly must-see TV. For the most part, however, the week hasn’t been all bad. For one thing, we have not missed the telephone. Almost every time that telephone rings, the person on the other end has been a telephone solicitor or a robo-call. What happened to the do-not-call list, anyway? Telephone solicitors do not even pretend to follow the rules anymore. It’s gotten to the point that we’re excited to recognize a friend on the other end, because it happens so rarely. But as I look over the past few days, I think I have been spending too much time on the computer — or at least I have been spending time on the computer unproductively. Fluffy has been spending his time doing family history. How have I been spending my time? I think I need to reevaluate the time I do spend. It’s good to go without the things you think you treasure the most. I’m not talking about people things, although Fluffy and I certainly gained a real appreciation for one another when we were separated by my three months in the hospital. But if you think you can’t go without food, try fasting. If you think you can’t get along without your telephone, “losing” that phone for a day or three might give you a real appreciation for that phone — or it might give you an appreciation for silence. Television? Well, that’s certainly something that can be a blessing or a curse. I have a friend at the temple who tells me every week about all the treasures she has found on educational TV. I am surprised her brain isn’t so big she has to wheel it around in a wheelbarrow. My brain, on the other hand, is probably the size of a gumball. I do not even want to tell you what Fluffy and I watch for entertainment. One of the things that make Mormons optimistic is that we try to see the silver linings in even the blackest of clouds. Although I hope I will not have to relive this week any time soon, it has taught me some things for which I am grateful. I need to appreciate my blessings more, and I need to pay more attention to those things that sometimes get lost in our tech-crazy world.